I got my two kids (7 & 9) an arduino starter kit for Christmas. I have this crazy idea that among the literacies my kids will need is some understanding of how our world is built up of little sensors tellings us everything. I have this hope that they’ll want to be part of it and try and build crazy little things around the house with these sensors. We’ve been playing for 4-5 days now and if we keep things up I’m sure I’m going to forget all the frustrations/victories that happened when we first started off. 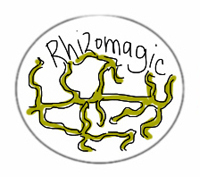 If you’re interested in getting started… this is what we’ve learned so far. As I understand it, Arduino uses a simplified version of C++. I can tell you that when i look at it, I can workout the majority of what is going on from the context clues and the notes that other nice people have entered into the code. If you’ve never looked at code in your life, you might want to find a friend to help you. 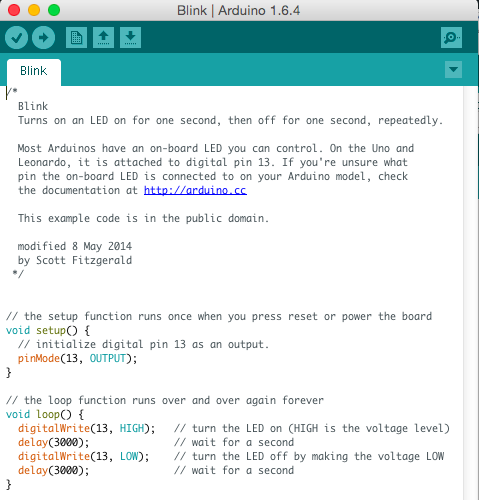 ‘arduino’ is also a piece of software that you need to download and put on your computer. It’s where you put your code (they often call it a ‘sketch’)and then upload it to your Arduino through a USB cable. There are tons and tons of sketches available online that you can use and the arduino software comes with a pile of examples. The examples by themselves are not really enough to get started as they don’t contain the things you need to do on the hardware to make things happen. If these instructions make sense to you… you can probably work on an arduino. This is diagram software that shows you how things attach in the arduino. It’s a donate for download. I’m still working through it. I figure it will continue to become more important as I understand more things. This is the stuff you have to buy. There are a million different combinations of this on the internet, so I’m going to list some of some of the things that you’ll need and I’ll include my fledgling understanding of what they are for. There are tons and tons of sensors that you can buy. They can sense light, sound weather things… pretty much anything you can imagine. They cost somewhere between $1 and $50 depending on what you’re buying and where. Sound Sensor – We used this to build this project that makes the lights turn on and off when it hears music. Here’s the demo from my kids. My kit had a bunch of others (humidity, light, RFID, etc) I’m happy with having just bought a pile in my introductory set and buying new ones as i need them. $2 free shipping on ebay. I got my little LCD display to work using a bit of code I found out there. The trick is to find the model number of the piece you have and search for arduino sketches that match it. It takes some time, but i find that everytime i do it, i learn a bit more about the overall package. 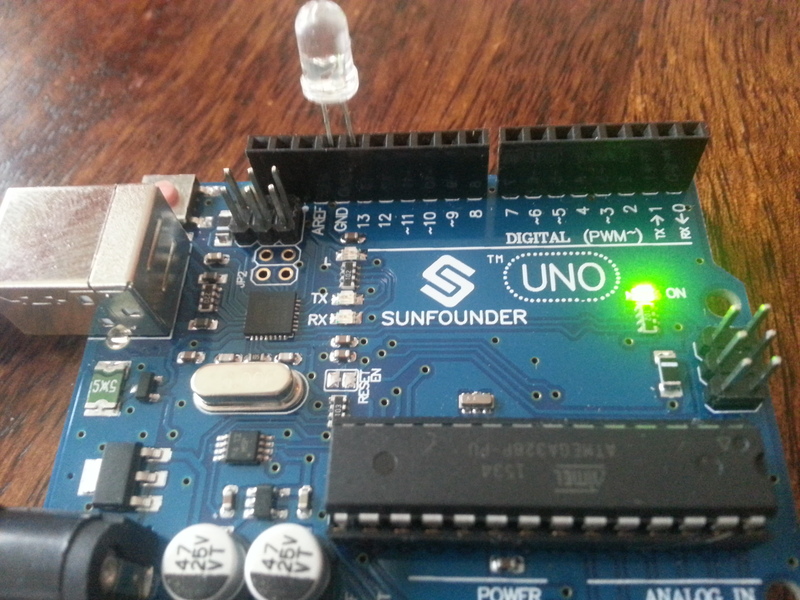 The Arduino approach is solderless. The wires all plug into the board and attach to the sensors. I bought a ‘breadboard’ which is basically a little connector that allows you to work out all the circuits. You need a breadboard. You need a pile of wires. You also need resistors. I’m not 100% sure what these do yet, other than that they control the way electricity goes in and out of things. I’m still researching this bit. Just attach them like they show you in the designs. You’ll probably want a passive buzzer, some buttons and LEDs. I’m using an old fishing tackle box to keep all my stuff in. Works great. Get a good digital multimeter (i bought this one). It will help tell you things about voltage, amperage and Ohms that I currently don’t understand but have it under good authority are super important. They will at least help you tell your resistors apart – which is some crazy arcane bit of business. Overall… get some hardware and get what else you might need later. Don’t sweat it. Just get started. Oscar, for whatever reason, has decided that the other two projects he’s interested in is making a weather station and a plant that tweets when it wants to be watered. Not sure how these are going to get built yet. One project at a time.